The twists and turns of Thailand’s diplomacy toward its neighbouring countries have recently undergone a metamorphosis. The military’s seizure of power from the elected government in May 2014 allowed civilian decision-makers and security officers to reboot ties with the bordering countries. But not all such attempts have been successful. For instance, Thailand no longer perceives its northeastern neighbour, Laos, as its closest and best friend. When the latest Lao government came to power in April 2016, Thailand had high expectations of a new era in Thai-Lao cooperation. In the past, Lao Prime Minister Thongloun Sisoulith, when he was deputy prime minister and minister of foreign affairs, would fly to Bangkok each April to commemorate the traditional New Year at the Lao Embassy. Since the end of 2009, Thai-Lao ties were further strengthened by the Abhisit government’s repatriation of Hmong refugees to Laos, at Vientiane’s request. Bangkok decided to do so for the sake of good neighbourly relations even though the US and the European Union (EU) severely criticised the Thai decision, fearing that the returnees would be prosecuted. However, the Thai government trusted Vientiane and went ahead with the plan, which ended 35 years of mistrust that had hindered bilateral ties. However, since the May 2014 coup, a series of incidents involving Thai political activists living in exile in Laos has damaged ties. Both sides have been extremely careful in managing this dilemma to prevent it from being spilled over into broader bilateral ties. In the past months, Thai and Lao senior defence officials have held two high-level consultations to discuss this vexing issue. But there has been no substantive outcome regarding the halt of exiled dissidents’ activities, which Bangkok views as political violence instigators. Vientiane’s perceived inertia and indecisiveness indicated that the Thai leaders do not have the necessary rapport with their Laotian counterparts across the border to ensure stable relations. This represents a low point in Thai-Lao relations. Thailand and Laos share a common border of 1,810km. The two countries went to war briefly over border disputes in 1987-88. Since then, both sides have diligently mended fences and nurtured good relations, citing similarities of language and culture as a foundation. Economic reforms in Laos under the “Chintanakarnmay” campaign in mid-1980 has enabled both sides to work more closely. Bangkok has played an important role in assisting modernisation in Laos, providing human resources training, capacity building and other knowhow. Thailand’s continued pledges to purchase hydropower from Laos have been a key commitment to Lao energy and economic planning and policies. Thailand also helped Laos to integrate with Asean after it joined in 1997. In contrast, Thailand’s relations with Cambodia and Myanmar have gone from strength to strength. The success of a recent joint cabinet meeting between Thailand and Cambodia in Phnom Penh is frequently cited as a prime example of the positive outcome when leaders are in sync and trust each other. 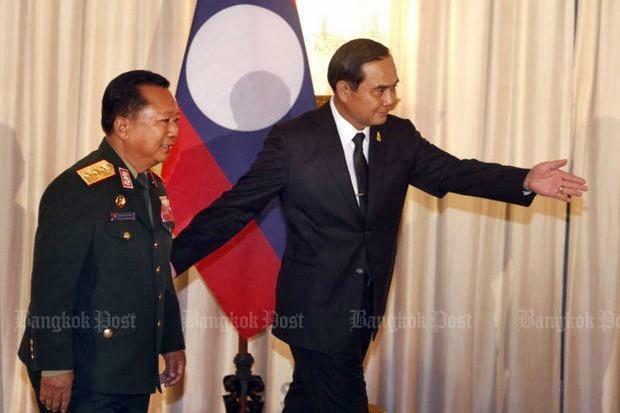 The widely publicised Sept 7 photo of Cambodian Prime Minister Hun Sen hugging Thai Prime Minister Gen Prayut Chan-o-cha showed the comfort level of their relationship. Hun Sen responded positively to Thailand’s request related to exiled Thai politicians living in Cambodia. The two leaders agreed to further enhance their partnership to promote peace and prosperity, particularly in connectivity infrastructure. By the first quarter of 2020, Thai-Cambodian connectivity — in which tourists will be able to travel from Bangkok to Phnom Penh by train — will rival that of Thailand and Malaysia. Bangkok has already completed its portion of the rail line, while Cambodia will finish its construction of the other 386km section inside its territory. Additional international border posts with so-called “common control areas” are planned. The recent opening of Nong Ian in Thailand’s Sa Kaeo province to Stung Bot in Cambodia’s Panteay Meanchey will facilitate the movement of people and goods. Most importantly, both Thai and Cambodian national leaders also strongly backed their special economic zones in the border areas of Trat and Koh Kong, and Sa Kaeo and Banteay Meancheay. It is important to note that this connectivity is part of more extensive economic plans that will open up the so-called Southern Economic Corridor. These emerging trading and production hubs will connect Dawei in Myanmar to Bangkok to Phnom Penh and Ho Chi Minh City under the Greater Mekong Sub-region. Already, Japan has agreed to provide financial and technical knowhow. A project of building parallel high-speed train has been discussed among the decision-makers from Japan and lower Mekong countries. Another corridor, the Northern Economic Corridor, of which Laos is a major transit point, is equally important and its progress is pending the level of Thai-Lao economic integration and overall connectivity. At this juncture, Laos is the only country with migrant workers in Thailand that has been reluctant to sign a memorandum of understanding on labour cooperation.Myanmar and Cambodia have already established government-to-government frameworks with Thailand to manage the movement of their workers across the border. Thailand wants to cut down migrant labour brokers and exploitation of existing systems. Vietnam will be next to do so, depending on future talks to expand the number of professions covered by the deal. Of late, more illegal movement of women workers has been detected across the Thai-Lao border, which could be problematic, given cultural sensitivities between the two countries. In the past three years, Thailand has been able to consolidate ties with Myanmar, Cambodia and Vietnam in security as well as economic areas. For the first time since the end of World War II, Thailand can credibly claim that it has established genuine close and functional ties with these neighbours.